Midwives are health professionals who care for women and babies from conception until several weeks after the baby has been born. Midwives’ scope of practice varies from country to country; in New Zealand, midwives are totally autonomous and care for over 80% of birthing women. In the USA, less than 1% of birthing women have a midwife. In some countries, midwives must be registered nurses first; in other countries, midwives are educated in direct-entries programs. However, wherever the context midwives work in they are committed to providing quality care and making a difference to women’s lives. working collaboratively with other health professionals in a way that promotes normal birth, reduces medical intervention and safe guards their autonomous role. It has always been my contention that the Internet and online communication and collaboration will someway help midwives to address this issues. But midwives have been slow to engage with the Internet and computer-mediated communication. 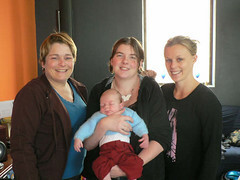 In 2002 I carried out a small online survey of New Zealand midwives’ use of the Internet. The main result was that midwives regularly used the Internet to find information which they shared with their clients and colleagues. They were interested in the Internet as a way of providing professional development, especially for those of them who lived in rural and remote areas. However, time constraints, Internet access and computer skills were barriers to using the Internet. In 2005 I carried out a national survey of midwives’ experiences of mentoring and asked specific questions about their use of electronic communication. Only a small number of midwives used email and very few had considered other forms of computer-mediated communication for mentoring. Over the last few years I have seen an increase in the use of the Internet, especially for formal education. A growing number of institutions are moving to blended delivery for undergraduate and postgraduate education such as Otago Polytechnic, New Zealand. There also appears to be increase in asynchronous international discussions that aim to support practitioners in developing countries. Initiatives such as The Virtual International Day of the Midwife are on the rise, and midwives’ uptake of Facebook for social networking and sharing information is noticeable. However, the issues of lack of skills and Internet access prevail, as well as concerns about digital identity and an attitude that learning and networking is best done in the face-to-face context. To my mind, there are several things that need to happen so that midwives can really effectively harness the potential of online communication. The leaders of the profession must recognise that social networking is happening and be pro-active in educating midwives on the professional use of websites such as Facebook. At the same time, they need to leverage what is going on in Facebook and Twitter for collaboration, education and research. Midwives cannot ignore how consumers are using social networking. I have noticed a marked increase in the political activism that is being done by consumers and home birth midwives on Twitter, and with Facebook and blogs in the last 12 months. Social networking facilitates non-hierarchical partnerships with consumers which should be exploited by midwives who are campaigning for change. The third thing I believe needs to happen is for midwives to embrace the concept of open access and open education resources. In education especially, we are forever reinventing the wheel. If we all made our resources more freely available, not only would we decrease our costs and increase collaboration, but we would be improving our practical support of colleagues in areas that have fewer resources. The one thing that midwives use commonly and easily the world over is mobile phones. So I am wondering if the way to connect midwives, provide professional opportunities and disseminate information in a large scale is to focus on mobile technology. What do you think? Sarah Stewart is a midwife, educator, consultant and researcher. Sarah is passionate about bringing people together so they can network, collaborate and support each other to make things happen.